The Graphite Series 760T full-tower PC case starts with a visually stunning design that’s a match for its stunning performance potential. The beauty begins on the outside with its sculpted shapes and ingenious, full windowed hinged side panel with flush-mount latches. The front panel has two massive 140mm intake fans bathed in soft LED light, and there’s a dual-speed fan selector for performance or silence. Inside, there’s ample cooling potential, with eight fan mounting locations and room for multiple radiators for self-contained liquid CPU coolers, or even custom liquid cooling. And, clever touches like modular drive cages and laterally mounted SSD bays maximize interior volume to help your high-performance dreams come true. The Corsair Graphite Series 760T Computer Case was added to the Computer Case category in June 2016. 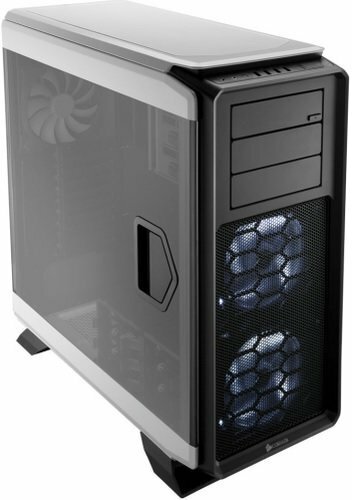 The lowest price GetPrice has found for the Corsair Graphite Series 760T Computer Case in Australia is $249.00 from PCcasegear. Other merchants who stock it are PCcasegear, Scorptec Computers, mwave, Amazon AU, Best Deal 4 U Computers & I.T..